Why Are Telomeres Important in Aging? Why Do Telomeres Shorten Over Time? Is There A Way to Lengthen Telomeres? Are There Other Ways to Keep Telomeres from Shrinking? Telomeres are repeating sequences of DNA at the end of chromosomes that helps conserve their integrity. Telomeres get shorter each time a cell divides, acting as a stopwatch that countdowns to aging. In the fight against aging, stopping or reversing telomere shortening is a topic that continues to be studied. Telomeres play a role preserving the integrity of your chromosomes. When cells in your body divide, telomeres get shorter until they can no longer shorten. At this point, cells stop dividing and eventually die. There are ways to prevent telomere shortening – some that you can start today without any medical interventions. Read on to find out how you could potentially prolong your healthy years and delay aging. Telomeres act as protective caps on the ends of each chromosome. They are like the plastic ends on a shoelace, protecting the ends from sticking or fraying. To more fully understand why they’re important in aging, we must first delve into how our genetic code is structured. DNA, or deoxyribonucleic acid, stores genetic information inside the nucleus of each cell in the human body. DNA takes the form of two long strands that make a twisting ladder or double helix. These helixes get tightly wrapped into bundled structures called chromosomes. In humans, each cell typically contains 23 pairs of chromosomes for a total of 46. When cells divide to produce more cells, they need to make copies of their DNA. During cell division, the chromosomes organize into X-shaped structures. The center of this X-shape is called the centromere. At the end of every arm in the X-shape, there are telomeres, which are regions with repeating sequences of DNA. DNA is stored as a code made of four chemical bases: adenine (A), guanine (G), cytosine (C) and thymine (T). These bases pair up with each other to form the double helix structure. Telomeres are repeating sequences of DNA. In humans, the sequence is TTAGGG on one strand and AATCCC on the other strand, which is repeated over and over at the end of each chromosome about 2500 times in human newborns. So, as we age, telomeres help prevent any genetic information from getting lost each time DNA is copied during cell division. To understand how to prevent telomeres from shortening, we must first understand how this process occurs. When a cell divides, the DNA double helix ladder untwists and unzips. Two copies of DNA can be made at the same time. Each half of the DNA ladder acts as a template. A short piece of RNA, ribonucleic acid, called a ‘primer’ helps the DNA replication begin. Once a primer attaches to one side of the ladder, the cellular machinery, which involves an enzyme called ‘DNA polymerase,’ can begin copying the DNA. 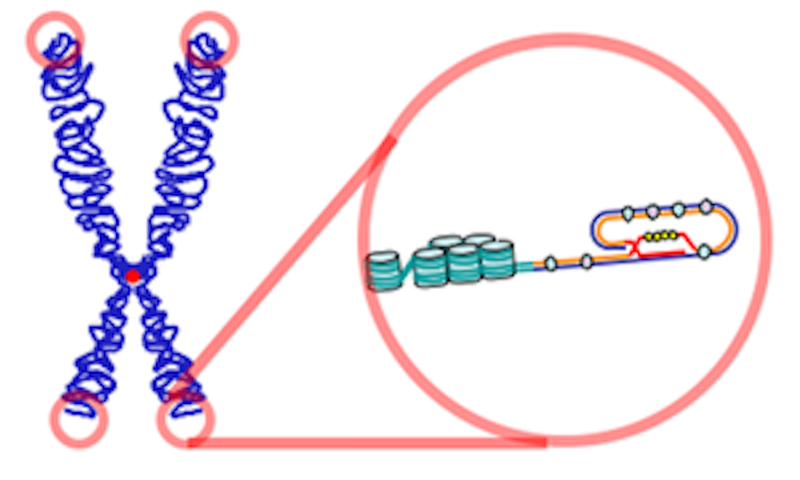 Unfortunately, the primer does not attach to the very end of the DNA strand being copied, so the new strand of DNA gets shorter by about 50 to 250 base pairs each time. One way to think about it is to imagine someone grabbing you by the hand and then trying to copy you with a portable scanner. She can’t copy the hand she’s holding on to while keeping you in place for copying, so that part is not copied. That’s what happens with DNA replication. The primer and DNA polymerase have to hold on to part of the DNA strand in order to copy it, so each time, a tiny piece of the chromosome does not get copied. Luckily, there is redundant information at the end of each chromosome – those repeating TTAGGG sequences of the telomeres. Each time that a copy of DNA is made, the telomeres shorten and a little bit of the chromosome gets lost. Fortunately, thanks to telomeres and their repeating blocks of DNA protecting the ends of chromosomes, none of the important information is lost. Eventually, however, telomeres get so short that they can no longer preserve the chromosomes and cell death is triggered. Telomerase is an enzyme that can extend the telomeres at the end of chromosomes. An enzyme is a special protein that can activate certain biochemical processes in the body. Telomerase can add extra repeating blocks at the end of DNA strands – more TTAGGG segments so that DNA can keep being copied. Telomerase is not very active in most of our cells because we do not want them to live forever. After a cell gets copied many times, errors get introduced in the DNA. Imagine a game of telephone, where a phrase is quietly whispered from person to person until the last one in line repeats out loud exactly what they heard. Copying DNA can be like a game of telephone. Errors get introduced as cells try to pass along information. Cells evolved with a natural fuse at the end of chromosomes to figure out how many times they can safely replicate. Tampering with that fuse could have serious consequences. Many cancer cells have very high levels of telomerase activity. The telomerase keeps adding more units to the telomere, making these cancer cells immortal, meaning they can keep dividing indefinitely because their telomeres never get shorter. Telomerase is not usually active in most cells of the body but it is active in germ cells – the cells that make sperm and eggs – and stem cells, which are special undifferentiated cells that can repair and replace tissue in the human body. Germ cells and stem cells need to undergo many cell divisions, so they need a way to keep their telomeres from shrinking. The quick answer is “no” – at least not currently, and definitely not completely. After it was discovered in the 1980s, people touted telomerase as the “fountain of youth.” Studies have been done in specially engineered mice who do not produce telomerase. Giving those mice telomerase then reversed signs of tissue degeneration or aging. This sounds incredible – a way to stop and maybe even turn back the hands of the biological clock inside each of our cells. Boost levels of telomerase, keep lengthening telomeres and cells can keep dividing indefinitely. However, it’s not that simple. Aging is actually a complex process. It represents the accumulation of many, many changes over time. Some scientists believe it’s a consequence of naturally occurring DNA damage that does not get repaired. This includes, but is not limited to, shorter telomeres. In cells that replicate slowly or do not replicate at all, like cells in the brain, heart and skeletal muscle, signs of aging have more to do with other DNA changes – not just telomere length. Too much telomerase can also be a curse, allowing genetically damaged or cancerous cells to keep dividing when it would be best if they were eliminated by natural cellular processes. Basically, the wrong cells could start replicating out of control if they are unable to age and die. Telomere dynamics are part of a natural process to keep healthy cell populations in check. Yes, there are in fact many lifestyle choices that can preserve telomere length. These include more exercise, less stress, no smoking and a balanced diet high in green leafy vegetables. Those, of course, have long been widely recommended as cornerstones for a healthy lifestyle. However, now it’s understood that they change us not only on a physical level but also at a cellular level. These good habits also help preserve telomere length. Reducing inflammation, the body’s natural response to protect itself from harm, can also slow down cell turnover and keep telomeres long. Some foods, such as salmon, tuna, tomatoes, olive oil, certain nuts like walnuts and almonds as well as berries help reduce inflammation. Reducing oxidative stress can also keep telomeres long. Oxidative stress is when cells ‘rust’ when exposed to unstable oxygen molecules – like apple slices turning brown when exposed to air. Steps to reduce oxidative stress include preventing infections, avoiding toxins, processed foods and added sugars. Taking time for daily stress remedies like mindfulness and meditation can make a positive contribution on this front as well. A number of studies show the link between meditation and telomere length. Scientists think the way mindfulness and meditation work may have to do with lowering levels of cortisol, a stress hormone linked to telomerase activity. People who practice mindfulness and meditation experience less stress, anxiety and depression, which have now been shown to slow cellular aging. While there is exciting new research done on telomeres and preserving their length to reverse aging, telomeres are not the only factor that contributes to cellular aging. Maybe someday the telomerase enzyme may be combined with therapies that correct other biologic damage to help prevent aging. In the meantime, managing daily stress and eating a healthy diet that contains foods that limit inflammation are the best ways to delay aging.